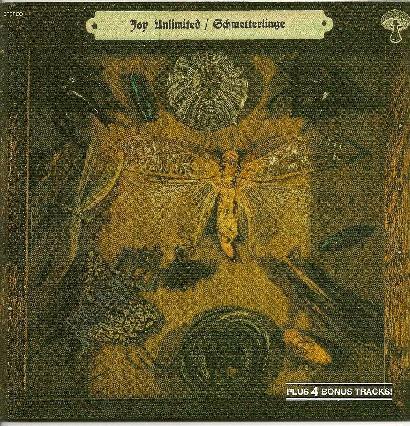 Joy Unlimited are a German based 70's band, somewhat Jefferson Airplane, Janis Joplin, Big Brother and the Holding Company in sound, although there is a definite Progressive construction behind these three movements. I call them movements because, if I'm right, the album was originally for the three parts of the ballet Schmetterlinge, or the English, Butterflies. Apparently the human beings stages of development correspond with the stages of the emerging butterfly in the play, so I will relate to it as a Progressive Rock Ballet suite, so we know what we are dealing with. The sound bears hallmarks of Progressive Rock, and a number of other elements, hence the Janis Joplin and Jefferson Airplane references. It also at time has remnants of Tommy era The Who, although these are minimal, yet they are there. As a musical piece it is not bad at all, a little strange perhaps, and I would expect the ballet accompanying this music to be quite surreal in nature, whether it is a different matter altogether! It goes through the movements mellow at times, chaotic at others. It is a manic, dark and surreal delve into the concept of how man and butterfly are thus related to one another! The majority is instrumental, and often theatrical, so you will have enough time to sit and contemplate the deeper aspects of the meanings. Also, the band performed this every night live when the ballet was showing, and that to me is true concept stuff. Surely there were drugs involved?